This week marks the start of THUMP, The Urban Mapper Project as we welcome the arrival of the foreign AIESEC Interns. There is Kharisma from Indoensia, Samanata from Nepal, Ahmed or as he prefers, Shimy from Egypt and Amy from China. The final member of the team, Will, is on his way from the UK at this very moment. The local team met with Chris Choong and Sophie from the UN Staff Association last Friday to have a final run through of the project. It was an opportunity to also get to know the local EP buddies, students who will be accompanying the international interns’ through-out the project and play an important role of translating and mediating their transition. Sophie who is currently interning at UNDP shared some of her experiences in studying anthropology and how she may be able to assist us especially in the aspect of entering a ‘foreign landscape’ for a project and to not hold prior prejudices or judgement. On the 23rd of July, we conducted the THUMP Cultural Mapping workshop at Sunway University. The workshop covered the fundamentals of cultural mapping, it’s processes and motivation as well as case study examples of groups in Malaysia that have conducted a mapping exercise as part of community-engagement activities.The idea was to give the students different perspectives of ways mapping can be used. For most of the interns, it was a new process all together. Samanata commented how she believes Cultural Mapping would be especially useful for where she comes from, Kathmandu, as there are significant cultural assets that can be mapped by the community. 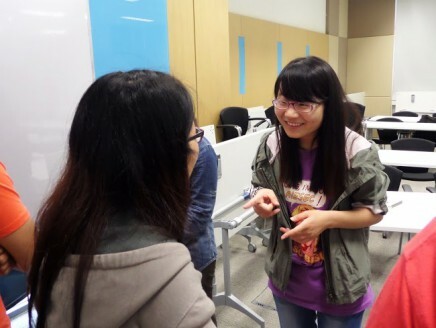 The workshop also included doing a hands-on mapping exercise where the interns were asked to first draw pictures that symbolises their childhood. Next, they were asked to draw things that symbolises their current day lives or future hopes and were then asked to explain to their partner what the symbols meant, and to draw links if any of the first set of symbols was connected to the other. It was an enlightening experience to see how such a simple exercise could reveal so much about a person, from their childhood fears to their ambitions, mapped out for the group to see. 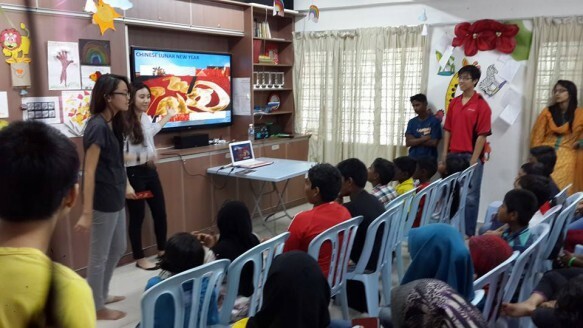 A number of the interns had strong links to wanting to travel and explore the world, which could reveal what brought them to Malaysia for this project in the first place. The ‘memory map’ is an activity inspired by Arts Ed Penang who were kind enough to share many of their valuable resources with us. In the last half of the workshop, we focused on synchronising an internal timeline for the project. The local team and I have done the leg work of meeting relevant stakeholders, understanding the gaps and needs of the community and finalising engagement dates, now it’s time to fill those activities with comprehensive content. 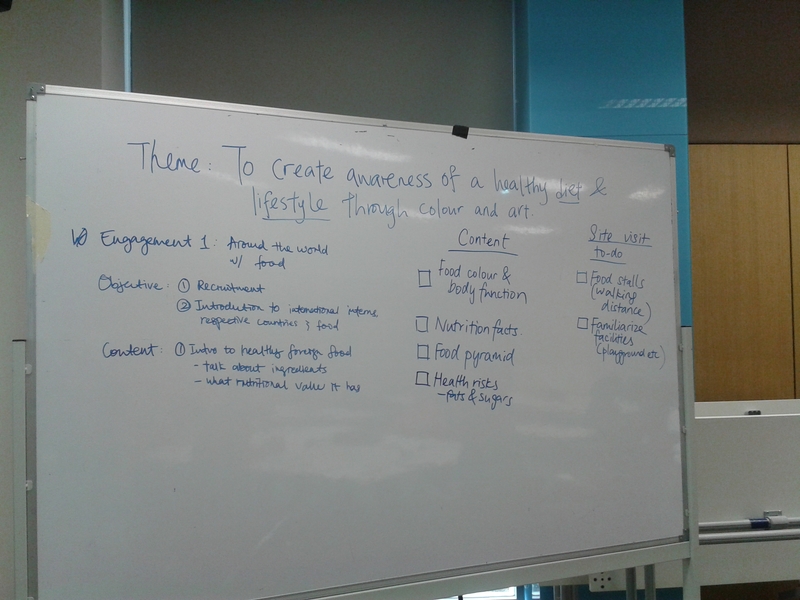 We decided that the theme of the project would, “Creating awareness of a healthy diet and lifestyle through colour and art”. Within that theme several activities had been explored, but first the team has decided it’s crucial to have a better understand of food and nutrition, so all activities carry an on-going theme throughout the project. As far as a first brain-storming session goes, the interns handled it really well. They were proactive in delegating tasks to complete before our next session. We plan on conducting a facilitator training sessions for the interns and Pik-Svonn from Chow Kit Kita has agreed to share some of resources with us. I’ll be meeting her tomorrow to find out more. And on Saturday the interns will be meeting with Jeffrey Phang of Friends of Kota Damansara at their very first site-visit of PPR Kota Damansara! 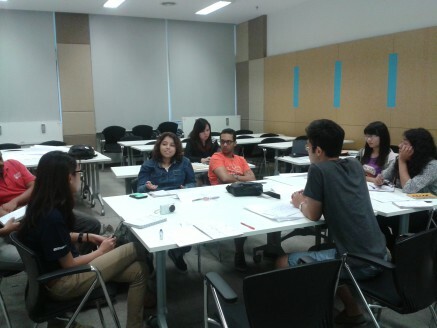 You can also keep track of this project via AIESEC Sunway’s THUMP Webpage as the project unfolds. Panel freeze, text wrap, page breaks. I am happy to note that to some extent I have mastered the art of efficiently using Microsoft Excel. 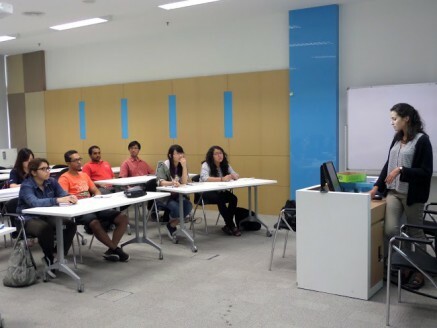 Okay, so maybe my days of project management are just beginning but I’ve definitely picked up a number of handy skills in preparation for the 6-week project #BetterCities is co-ordinating in PPR Kota Damansara. This year, we have taken a closer look at the urban vulnerable groups in our city starting back in March when we had #BetterCities talk series on the influence of policy and design in social housing. In the process of organising the talk, through selecting the speakers and understanding the issues, we learned more about the People’s Housing Project (Projek Perumahan Rakyat or PPR). PPR is a housing scheme provided by the National Housing Department for low income households in Malaysia. PPR’s usually take the form of high rise flats between 5 to 18 floors situated in different parts of the city, some central and some on the outskirts. Each PPR has its own demographic, set of politics and stories. We were approached by the UNDP sometime in April to assist in programming a project in a PPR with AIESEC. As a global youth network, AIESEC conducts summer community-engagement internship programs for students in different countries around the world. 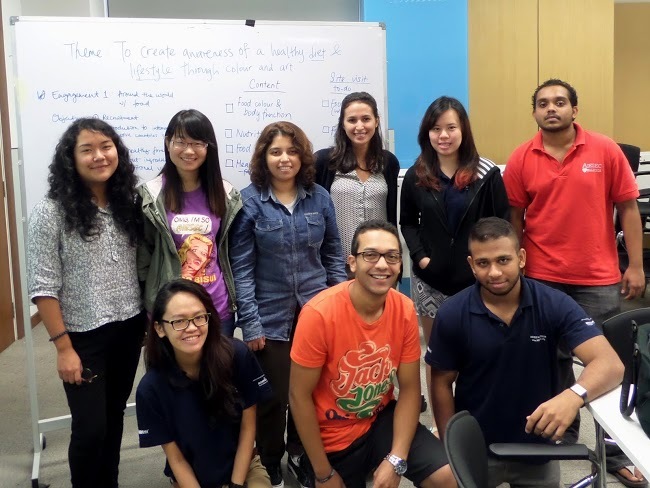 For this project we have partnered with AIESEC Sunway and will be working with selected interns from Indonesia, Nepal, England, China and Egypt. 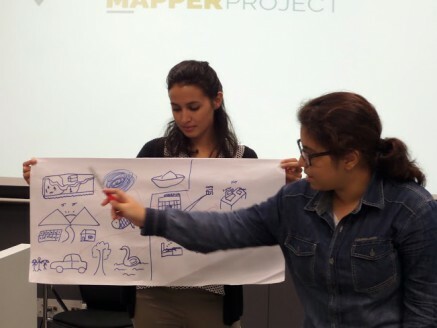 #BetterCities has programmed ‘Thump, The Urban Mapper Project’ which is a mapping based activity centered on the issue of food and nutrition with children aged 8-10 in the PPR. The activities are mostly arts based which inadvertently tries to understand what kinds of nutrition sources the children are getting or lacking as well as health implications this may have, all while introducing a healthy lifestyle and diet. Over the next few weeks I’ll explain the activities in more depth as they take place. The project officially starts on the 21st of July and ends at the end of August 2014. 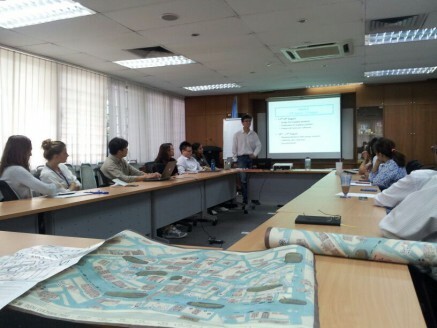 The AIESEC team at a Brown Bag Session at the UNDP explaining cultural mapping using LostGens’ Pudu Community Map as one of the examples. Some of the early preparation involved meeting with different NGOs that work closely with PPR Kota Damansara to better understand the needs of the community and its networks. Friends of Kota Damansara (FoKD), Gempaknya My Community (Bumblebee) and Community Excel Service are some of the many NGOs that are doing a range of different ongoing good work in the PPR. 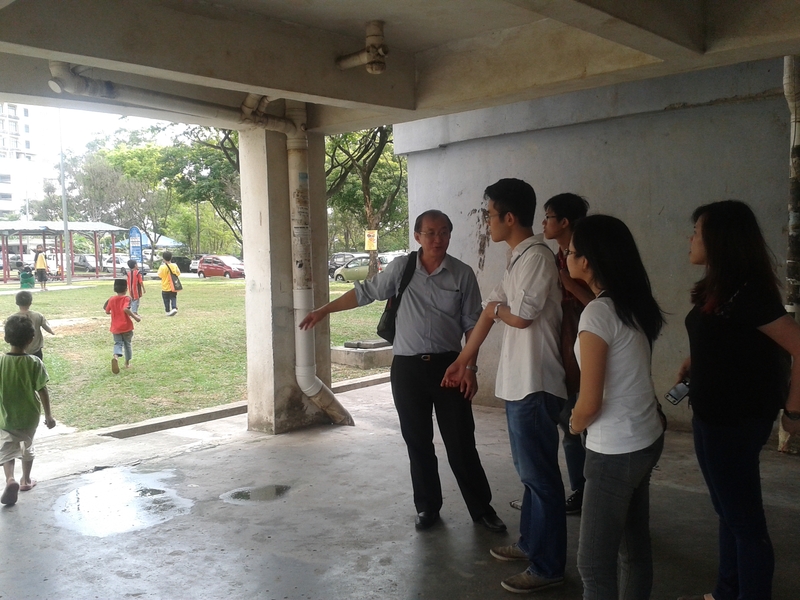 We also met with LostGens’ and Arts-Ed from Penang, two groups with years of experience in community art projects and community mapping to exchange ideas. The decision to map food and nutrition was made after meeting all the different stakeholders and after a series of observations. Other areas of interest that came up were issues such as hygiene, safety, social mobility and racial dynamics. Given the time, scale and context of this project however we felt that food and nutrition would be an interesting issue to creatively explore especially with children. Among some of the skills the interns will be picking up is filling in lesson plans for the activities, learning how to engage with the children and using English as a second language with the help of translators. I for one can’t wait to finally get started and meet the kids. I will be keeping track of the progress with a weekly blog post update, be sure to stay tuned for more! Our design intern, Lay Sheng responds to Jia-Ling’s recent article, “Unpacking the KIDEX Controversy” on his experiences living carless in Kuala Lumpur having lived in Singapore for six years. 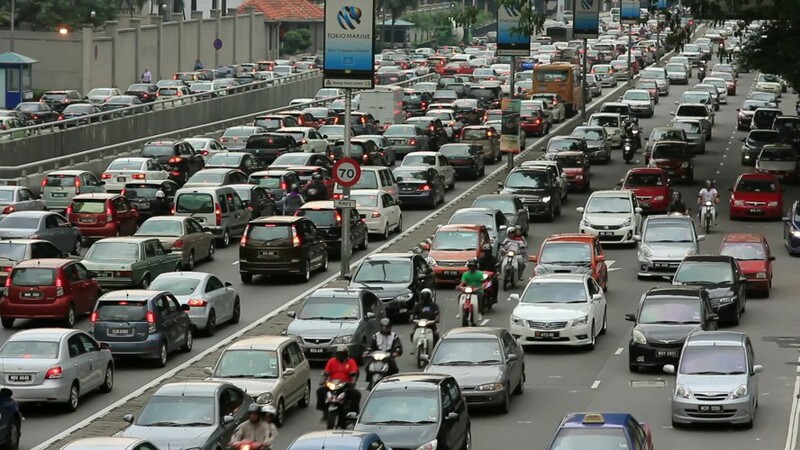 Navigating through Kuala Lumpur’s traffic gridlock is like attending a massive funeral procession that moves forward in a slow crawl. It is a gathering of strangers who keep to themselves. Each one of them feels this lingering depression, simmering anger despite the air-conditioned interiors in our cars, and go through the occasional outburst of emotions in the form of a ‘honk’. The death is inevitable. Kuala Lumpur could not have survived the massive clogging of its artery. We believe that owning a car empowers us. Sure, getting anywhere you want with such ease is the hallmark of freedom and adulthood. But the ownership of an automobile inevitably means we are constantly chained to it like a slave is to its owner. We are the slaves. We work manually to drive it, clean up the dirt accumulated in its system over the weekend, and we care obsessively about its health and safety. Correct me if I am wrong, but a driver’s mind is always pre-occupied with thoughts like I need to get my car parked under a shade, Is it safe to park here? Will my windscreen be damaged by other cars? This kind of preoccupation with the state of your car disengages us from our surroundings and shuts off your minds to the many delights of travelling that. 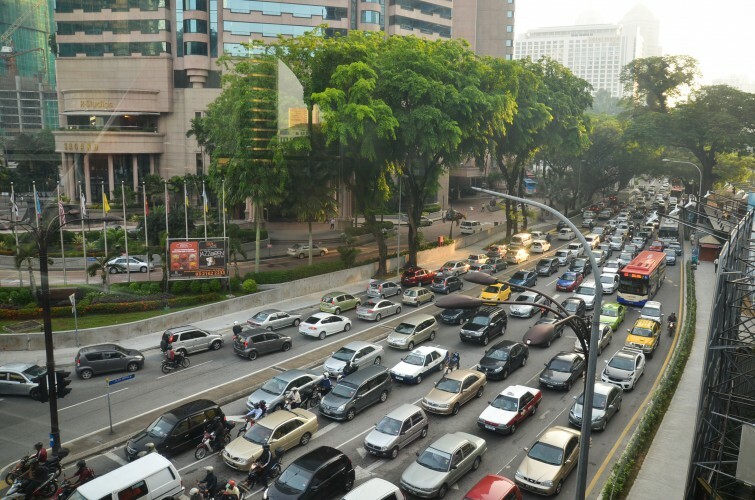 Navigating through Kuala Lumpur’s traffic gridlock is like attending a massive funeral procession that moves forward in a slow crawl. Moreover, where we want to go is not a choice. In our city, it is dictated by big developers who built roads in a certain direction, shopping malls that are strategically placed to be reached easily. We will never be able to go to places only reachable on foot. Owning a car is buying into a way of life designed by the developers. Now, we purchase our goods from big retail parks located in the outskirts of town (think Johor Premium Outlets), buy houses in Shah Alam just to travel all the way to Kuala Lumpur for work and justify a way of life that punishes the minority of KLites who walk and cycle. Our freedom is confined to the choices made possible by the powerful elites within the developer circles. Our freedom is built on the misery of the cyclists and pedestrians. 35% of Malaysia’s consumption of fossil fuel goes to powering its cars. All of us are indirectly murdering a third world family by continuing our unsustainable dependency on our automobiles. By contributing to global warming, we are arguably worsening the already deadly impact of typhoons and increasing the rate of desertification of arable land, denying farmers the ability to support their families. Just because the immediate impact of global warming does not affect the comfortable middle class amongst us, it does not mean we can absolve ourselves from all the responsibilities of protecting our more vulnerable brothers and sisters and the sins of having been part of such atrocious crimes against humanity. Why do we believe so gullibly that ownership of a car would guarantee us freedom? When I first returned from Singapore to Kuala Lumpur, I remained in my house for a long time. It was partially due to the phobia of stepping out of the house and exposing myself to the discomforts of travelling around. During that period, the newspapers reported multiple murders in broad daylight and my parents kept cautioning me about being alone in the city. Crossing the road was a hazard because death could be just around the corner, the KTM was a hotbed of crimes like pickpocketing and robbery, Malaysian taxis are famous for over-charging its passengers and the public bus only stops once every hour outside my housing area. But the boredom of being at home finally forced me out of the compounds of my house. I adjusted slowly to the rhythms of life in Malaysia and found ways to adapt to the deplorable state of public transport in Malaysia. Walking became my main mode of getting around between places not served by public transport. While my cortisol levels must have gone up by leaps and bounds battling car drivers who mistreat walkers, I have also found sanctuaries within the city not accessible by car. Walking became much more than a means of travelling around the city, it became an experience itself. Walking allows me to be immediately connected to my surroundings. Through all the solitary walks, I became infinitely more aware of my own existence in a metropolis teeming with people like Kuala Lumpur. Strangers who walk are friendly to each other. A smile, a nod or a greeting to people we see everyday while going about our same routine, is what binds a community together. In our cars, the customary form of greeting is a ‘honk’, and one can never distinguish if it was meant to nudge other drivers or if it was a friendly ‘hi’ replaced by the piercing mechanical scream of a ‘honk’. The kinds of interactions that exist on the roads are devoid of emotions and language. It takes places between unfeeling, inorganic machines. Drivers on the road will never feel a sense of community as pedestrians on the streets do. On the road, each driver is an isolated being sheltered from the noise and heat outside in the air-conditioned interiors of their cars. But eventually, taking public transport and walking under the scorching hot sun became intolerable. The initial novelty of travelling around a city I was not familiar with has slowly worn off. Commuting to work took more than an hour and the dread of waking up every morning got worse. I became increasingly disillusioned with taking public transport and slowly substituted my commute with private taxis. I can’t wait to get out of this city. An all-encompassing solution to our traffic problems cannot of course rely solely on the improvement of our transport systems. On top of measures to improve our rail transit and public buses, the landscape architecture and urban design of KL should also be prioritized. The psychology of walking on the streets, the perceived danger of venturing out, and tackling the heat and noise pollution on the streets are just some of the areas we can begin to focus on. The government, no matter state or federal, cannot continue the trend of building more highways to solve congestions. It is time for the citizens to be more vocal about KIDEX. 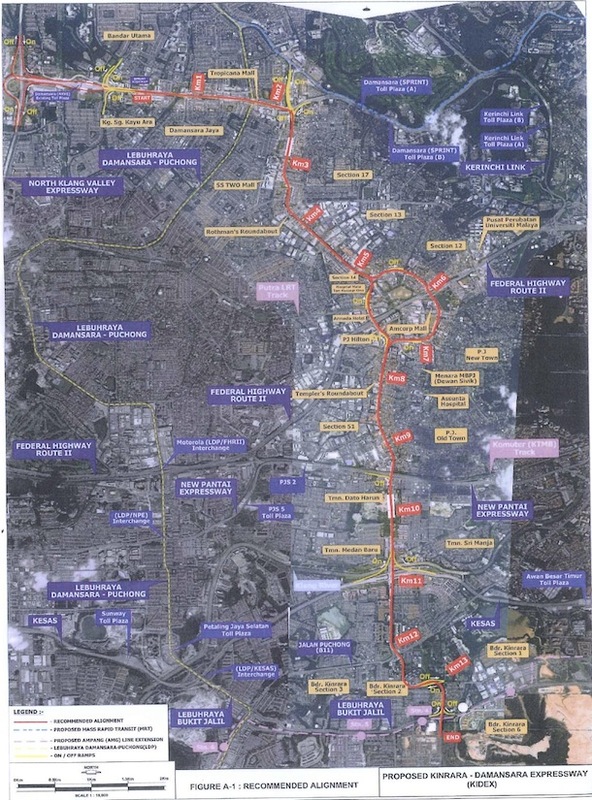 The recent controversy surrounding plans to build an elevated expressway between Damansara and Kinrara has brought our attention to the issue of transportation, notably highways and our city’s utter dependence on them. One of the most disagreeable aspects of living in our city is how our lifestyles are largely determined by our reliance on cars to get around. As much as we love our city, the experience walking around downtown is unpleasant if not harrowing. Frangipanis lining the street are no match for the smell of exhaust at street level, walking is a constant obstacle course where if you’re lucky you might get the chance to out-manouver a sinkhole, cars whizzing by pose a constant life or death threat, cursing out pedestrians when they should be the ones slowing down. In The Happy City by Charles Montgomery, he describes how driving is detrimental for brain and body. The stress that one encounters in bad traffic triggers a toxic stew of stress hormones that in the short term make you more alert, but in the long term can make you ill. According to Montgomery, it takes at least 1 hour post driving for stress levels to return to normal where our ability to concentrate and heart rate is restored. The stress experienced while driving during peak hours exceeds that of fighter pilots and riot police facing angry mobs. The longer one travels, the more detrimental it is as well. Researchers found that the ideal commute is a 16 minute drive in one direction. Longer than that and driving becomes increasingly stressful where the further one has to travel to work daily the less happy they are. So back to this expressway that has caused many an angry uncle to vent, and politicians to bristle at the thought that they may actually have to mediate an issue face to face with an upset, name calling constituency. 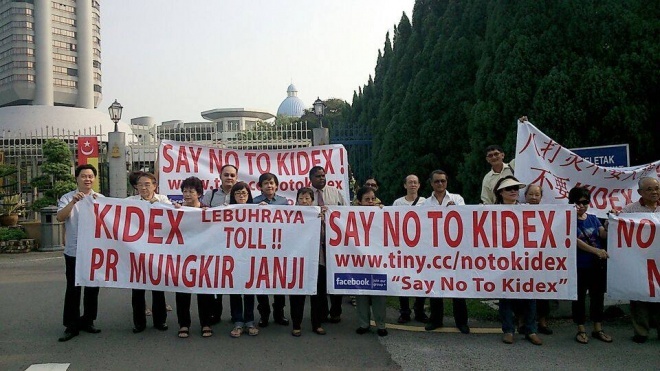 Perhaps it is a moot the point to say that we should protest KIDEX because we should protest highways. KIDEX would have been built right under our noses had it not been for these public protests, and KIDEX was singled out because it cuts through the well established townships of Petaling Jaya, Damansara Kim and Kayu Ara directly affecting the physical landscape and environment of the area. Even so, protests against the construction of an urban expressway for any reason is a good thing. Such a controversy is a jumping off point to initiate a conversation about the state of transportation in our city. Fact is, increasing private car ownership and the endless construction of highways within a city is bad for livability and quality of life much less the environment. This is where the KIDEX debates can help – to shed some light on the issue of urban traffic congestion. The KIDEX controversy and the claims made for and against its construction allow us to understand the kinds of assumptions used to justify why our city needs more highways and creates a space for a critical evaluation of these assumptions and the consequences they have on our built environment. Indeed, the basic argument used to justify most road expansion projects, KIDEX included, is that increasing vehicle ownership will require more roads to ease congestion. This very basic claim is largely self fulfilling in that it takes for granted the current pattern of vehicle ownership and uses future projections based on current growth rates as the justification for building more expressways.This line of thinking precludes the expansion and use of alternative means of transportation, and takes private vehicular travel as a constant, continuing trend. While KIDEX’s Traffic Impact Assessment and claims that KIDEX will effectively ease traffic congestion on existing highways has been challenged for their statistical accuracy, the crux of the issue here is greater than pointing out errors of calculation. The real issue that we should be concerned about is the much more complex and somewhat quixotic problem of how we can restructure the way we move about in the city in a more humane, sustainable and climate friendly way. Studies have shown time and again that more roads do not ease congestion. The lack of attention to this fact, or rather, a convenient ignoring of it, has perhaps put us on the path of such short sighted, remedial solutions as building more expressways, setting us on a vicious cycle with no end in sight. Furthermore, not only do these highways mar the landscape of the city, often times, they cut through existing green space, destroying all that is pleasant and uplifting about our city. Expressways such as SKIP and KIDEX may benefit some people with a faster commute, but they contribute to the worsening of our quality of life as a whole over the long term. Looked at in this way, we are spending an exorbitant amount of money (RM 2.4 – RM 3.4 billion) for little gain and are further disenfranchising lower income groups by neglecting our inefficient and disconnected public transportation network especially the public bus system and bike paths. 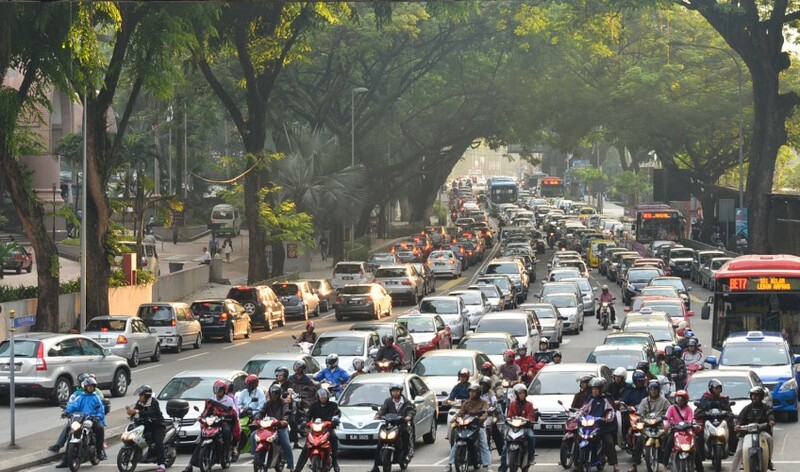 It is unfair to many that transportation developments in KL is so heavily skewed towards privileging the private car owner and this has to end if we are to have a more just and sustainable future. While the jury is still out as to how much public transportation system can ease traffic congestion, a robust public transportation system provides options for people to get from Point A to Point B, and places more pedestrians on the streets. It enhances connectivity within a city for those who may not be able to afford or do not desire owning a car. Furthermore, an efficient public transportation system slows the rate of growth of car ownership over the long term as people need not depend on a car to get around. Congestion woes aside, fewer cars is good for the environment. Our dependence on cars as the primary mode of transportation has decimated our public street life, which can only happen if we have a multi-modal transportation system that puts people back on the streets. Pedestrians, and by extension individuals who take public transportation, are the lowest common denominator on the streets of KL and this is a huge blow to our sense of place and community. Perhaps this is what needs to change if we are to talk about a #BetterKL. One cannot begin to imagine the positive changes that could be catalysed with that RM 2.4 billion KIDEX is slated to cost should it be used towards realising alternative ways of getting around in our city beyond that of the privately owned car. Keep a look out for a related article by our other #BetterCities intern Yap Lay Sheng on his experiences living carless in KL city.